The real J. Peterman might not fully possess his own identity anymore — not since "Seinfeld" hijacked it more than two decades ago — but at least he still has his stories. In central Ireland, stranded by an acquaintance at an inn with no heat and a shower that didn't work, he discovered "hot whiskeys," rode horses and found himself in an impromptu road race in a rented Audi against a Mercedes driven, he discovered later, by the most beautiful woman he'd ever seen. At the U.S. embassy in India, he rubbed elbows with foreign dignitaries at a dinner party he helped arrange for himself with a call to his senator and the American ambassador to India. In La Paz, Bolivia, at 10,000 feet, he watched an uprising unfold, with thousands of protesters in a town square and a few men on a balcony trying to rile them up over something having to do with coca, the U.S. Drug Enforcement Administration and corn. Why travel to Bolivia at all during a time of social unrest? "They make great sweaters!" People have heard of John Peterman but think we're a figment of 'Seinfeld.' ... Too many people think we're a made-up company. John Peterman, founder J. Peterman Co. The real Peterman, in this case, is John Peterman: retailer, former baseball player, Kentucky rancher, one-time author and subject of the transcendent imagination of a copywriting genius whose rendering of Peterman's exploits became, in turn, the subject of the comedic genius of Larry David and Jerry Seinfeld. The company bearing his name, the J. Peterman Co., has survived more than three decades, despite a bankruptcy in the 1990s, the loss of its main creative progenitor, the aging of its upscale customer base and the eternal vagaries of the apparel market. It has also survived a stint as a joke on "Seinfeld" and Peterman's portrayal by John O'Hurley, who played the catalog retailer by name. The sitcom helped make "J. Peterman" a household name — but with a caveat: Most "Seinfeld" fans don't know Peterman is a real person, running a real company, according to the retailer's own research. "People have heard of John Peterman but think we're a figment of 'Seinfeld,'" Peterman told Retail Dive in a March interview. "'Seinfeld' is kind of a nonstarter for me. Too many people think we're a made-up company." That part of the company's history could be chalked up to dumb luck — who could possibly anticipate it being parodied on one of the most-watched, most-syndicated, most-referenced and most-loved sitcoms of all time? Yet, it wouldn't have happened if Peterman was not Peterman and if his company wasn't what it was: a retail enterprise that, by most appearances, is actually about something. The docks of East London. Hemingway's Ketchum. Panama's Canal Zone. Bombay. Tannah. Jebal Ali. Munich. Zihuatanej. Sochi. The city names and exotic locales drop cozily into the J. Peterman catalog copy, and there's typically nothing fictional about them. 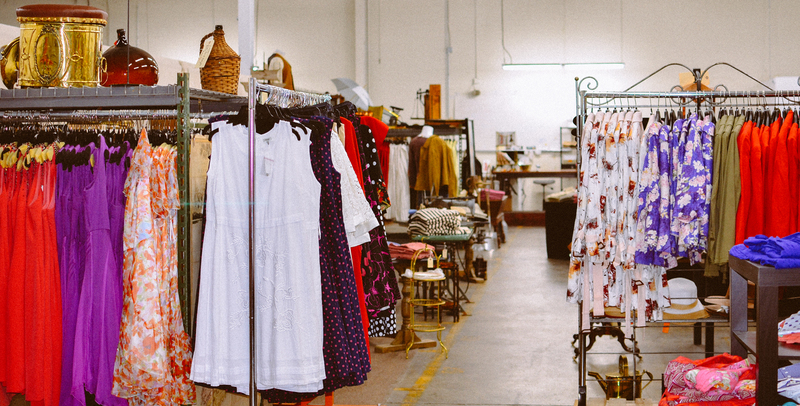 Peterman and his merchants have indeed traveled the world, combing its hidden vintage shops and fine boutiques in search of interesting things to buy wholesale, reproduce or work into their own designs. 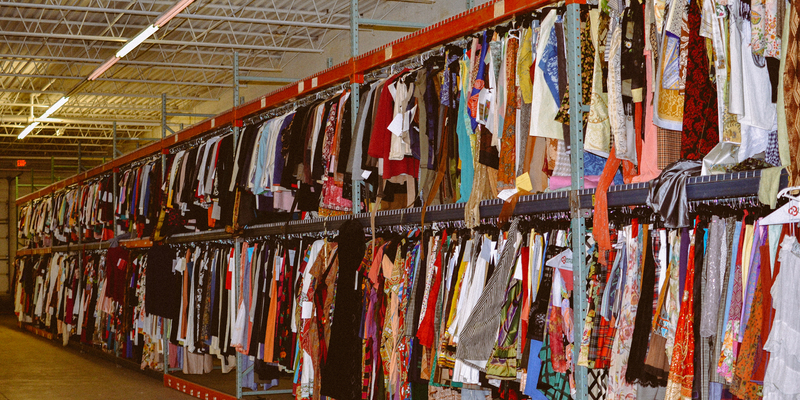 Today, the romance of the catalog is largely produced in a distinctly unglamorous warehouse in a suburb of Cincinnati, near a Kroger distribution center, an office furniture liquidator and an upscale pet kennel. One of the antique BMW motorcycles Peterman wanted to sell through his catalog before running into legal hitches with trade agreements. 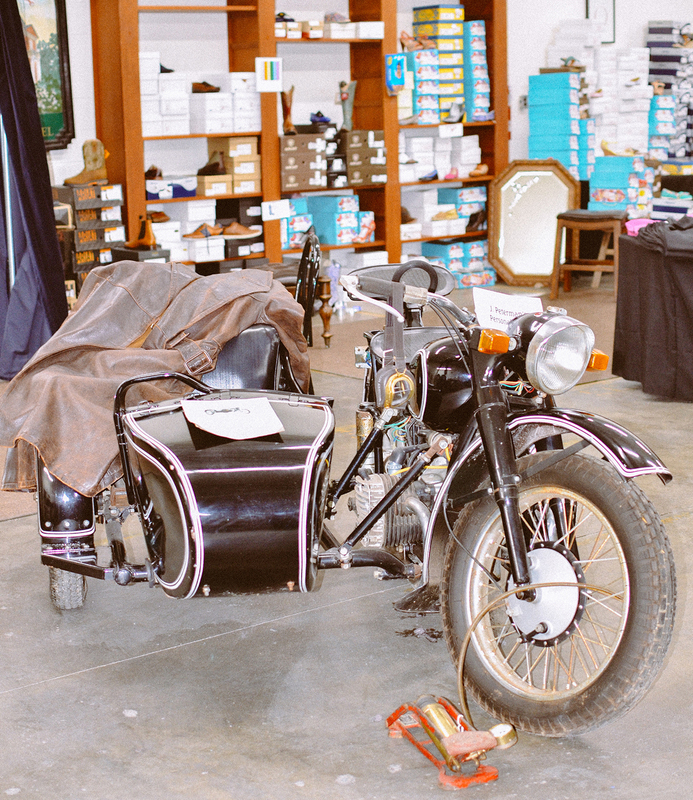 Inside that warehouse is J. Peterman's inventory of coats, sweaters, dresses, shoes, scarves, rum aftershaves, "Great Gatsby" shirts, cowboy dusters and, among other items and curiosities, an antique BMW motorcycle with a sidecar. (The latter was one of a couple dozen that Peterman imported from China years ago and tried to sell to his catalog readers before running into legal hitches with trade agreements and such.) The building also houses "The Archives": a field of racks that hold just about every article of clothing J. Peterman merchants have purchased in boutiques around the world in the past three decades. Memorial Day at the Bagdons', Fourth of July at the Grafs', and Labor Day at the Klutchkas'. The characters and the conversations don't change, either. Betty Goodman tells you more than you need to know about her short-lived delphiniums; the Tennetts arrive an hour late in their Chris-Craft Runabout and make a grand entrance; and Bill Hart quietly pulls you aside and asks if you can spare a few thousand. Clearly, it's time to shake things up. It goes on from there, eventually getting to the shirt. Sitting in an office, while telling stories from his commercial exploits and adventures overseas, the bespectacled Peterman put pinches of Copenhagen dipping tobacco in his mouth and liberally dropped f-bombs and other expletives into conversation. (It's a charming habit to an inclined listener, which would include your correspondent). People are spending money on augmented reality so they can make their products look more real — and these guys are giving you line drawings. You've got to love him for that. In a roundabout way, and maybe not on purpose, he outlined the intended meaning of his company and really much of his life through a description of a teapot. "There are some Saturday mornings, when it's s---ty out, and I have a fire going in the fireplace, when I sit and drink English tea, and drink it in a silver English teapot," he said. "It's a 200-year-old tradition. If it's from England, it's just a little bit different." In both the retailer's marketing copy and in its assortment, the company looks to achieve something Peterman has long called "factual romance" — interesting, true details that describe a product's living context. This quality, perhaps chief among all those of the J. Peterman Co., has helped sustain it since the late 1980s. That longevity is no small feat. "Retail is hard," Nick Egelanian, president of retail development consultants SiteWorks International, said in an interview. "For every great retail company, there are thousands and thousands of failures." J. Peterman exists in a space that is much changed but still relatively vibrant. Catalogers might send out half the mailers they did a decade ago and rely on websites rather than call centers to process orders, but the paper catalog still plays a crucial role in marketing. Magid, for instance, has found that 40% of apparel shoppers first learn about products through direct mail. J. Peterman's survival is not and never was guaranteed — it's faced several major setbacks in the course of its life. And much like J. Crew, Land's End and other (largely) direct retailers, it has suffered most when straying from its core principles and customer base. The romance of the company's copy and product art has played a major role in the merchant's lasting appeal. "They have the ability, it seems, to use words, texture and imagery in a way that stimulates the creative part of your mind. I think that's a trick," Egelanian said. "People are spending money on augmented reality so they can make their products look more real — and these guys are giving you line drawings. You've got to love him for that." J. Peterman has long sought out unique products from far-flung locales that make statements about a place or a part of history, as well as about the customer who might purchase it. Which brings us to the duster. The story of Peterman and his Wyoming duster has been told so often in print — not to mention by Peterman himself in person and nearly all of his associates that Retail Dive spoke with — it's almost not worth recounting here. But it is, after all, the founding narrative of the J. Peterman enterprise. In 1986, Peterman — for no particular reason other than that he was bored on a business trip in Denver and felt like exploring — moseyed over to Wyoming. One day he found himself at an outdoor outfitters in the ski town of Jackson Hole, where, on a rack at the back of the store, he found a coat he liked. "It was cut very long, all the way to the floor, similar to the ones in the 1880s," Peterman wrote in his 2000 autobiography. "They had to be long because cowboys wore them for protection from the dust, rain, snow and mud while they were riding their horses." Against outsiders' advice — and common sense — the J. Peterman catalog has marketed its apparel products with water color illustrations. This year the retailer for the first time plans to use on-model photography, on its website only. To Peterman — who as a kid pored over stacks of National Geographic magazines under a pull-string light bulb in his attic and dreamt (several generations too late) of leading a cavalry charge on horseback — the coat conjured up all kinds of romantic notions about cowboys and travel that had long fed his imagination. At the time he discovered the coat, Peterman was working as a sales consultant, having previously worked for more than a decade in sales management with General Foods and Dole Pineapple. Before that, he played professional baseball with a minor league team in Pittsburgh, but he was undersized and had broken his leg during a game in Florida, setting him up for a career outside the sport. After buying the coat in Wyoming, he wore it everywhere. "Everybody liked the duster," Peterman said in his book. "I think the coat said the same thing to them that it said to me — they, too, wanted to be their own person." Don Staley, a longtime friend, told him, "You know, Peterman, I like you better because you're wearing that coat." At the time, they were in Staley's apartment. Staley — who had worked with Peterman briefly on an advertising contract for the state of Kentucky that Peterman maintains they lost within 24 hours of winning because a competitor pulled the right political levers — had started his advertising career as a painter before turning to copywriting. They decided to write some copy for an ad, which promised "[p]rotection against the winds of Wyoming, the blizzards of Wall Street." Peterman and Staley's initial idea was to sell a few thousand coats. "We made a deal," Staley told Ad Age in 1994. "I said, 'As I start spilling out ideas in the course of our friendship, if we ... want to go forward with [an idea for a business] and actually work on it, let's do it, and we'll split the pain and the misery and the fame and the money, if there is any, 50-50,' and he said fine." Peterman today says that the name-dropping, globe trotting adventurer in the catalog was a figure largely created on Staley's typewriter. "I was his subject. I was the guy who did it. He was the guy who wrote about it," Peterman said. "He would never have gone to Jackson Hole, Wyoming, on a whim, though he may have wanted to." The duster, along with symbolizing Peterman's approach to life and retail, also set his business in motion. He and Staley hit "pay dirt" with an ad in the The New Yorker, which helped sell around 70 coats. What followed was a manic juggling act that, to some extent, describes much of his life in retail. As Peterman described that time in a 1999 Harvard Business Review article that he wrote: "I would buy dusters on 30-day terms, secure the ad space, and then use the money from the sales to pay for the ad. But then I had to run another ad to get the money to pay for the dusters. It worked in a cycle, and a few cycles into it, I realized that I couldn't afford to get out of the business; I owed so much money." In fall 1988, the company put out its first catalog, which — against all common sense — managed to sell products using black-and-white drawings, as well as the literary copy style that drew shoppers and would later inspire parody. Their spring 1989 catalog was in color but still eschewed photos in favor of illustrations. In 2017, J. Peterman opened an outlet store at its warehouse and headquarters near Cincinnati, OH, a store Peterman writes off as a way to liquidate inventory -- nothing like his splashy physical stores before the company's 1999 bankruptcy. "It's kind of amazing that the company has been able to stay alive as long as it has without [customers] seeing an on-model photograph," Matt Peterman, the retailer's son and today head creative for the company, said in an interview. In the early going, Peterman's wife, Audrey, ran the company's backend operations and was one of maybe four full-time employees. At the time, Peterman also ran a company that sold beer cheese, which he made in the same building that housed the J. Peterman dusters and other fine clothing. Their first year, J. Peterman Co. made $300,000 in sales on media ad space alone, Peterman said. By 1989, the company did $4.8 million in sales and had its first deal with a venture capitalist firm, Hambro America. 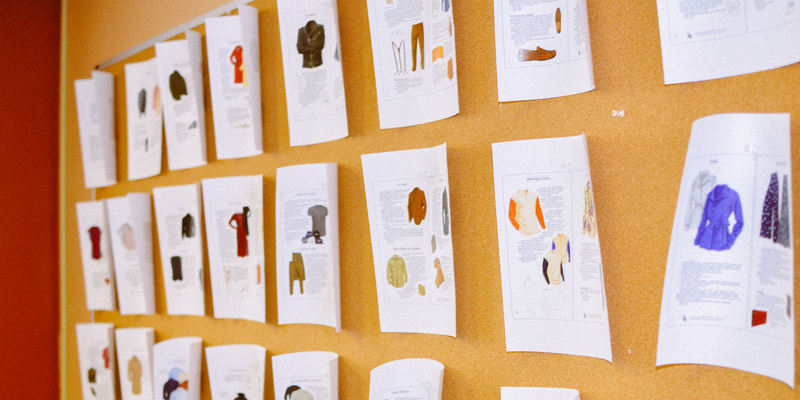 The next year, J. Peterman made nearly $20 million, and the company's staff expanded to 80 people. The company's clothes and catalog won ever more attention, including among the famous and influential. "Then, in the distance, I heard the bulls, and I began running as fast as I could," the fictional Peterman said. "Fortunately, I was wearing my Italian calf toe Oxfords. Sophisticated, yet different without making a huge fuss about it." John O'Hurley, actor who played Mr. Peterman on "Seinfeld"
It was a pitch-perfect parody of the catalog, which itself is a stylized version of the real Peterman, who is indeed a raconteur full of wanderlust. The real Peterman wrote in his book that the show aired "without me knowing a thing about it. … It was kind of flattering that the Seinfeld people felt J. Peterman was interesting enough to create a character around." As it happens, O'Hurley originally said no to the part, or tried to. Shortly before Larry David's office inquired about the Peterman role, "A Whole New Ballgame," a sitcom O'Hurley starred in, had gone off the air. "I'd just had my own show canceled," he said in an interview. He told his manager over dinner at the time, "I don't want to guest star in someone else's, No. 1 show or not." But his manager never passed along the message to the show's producers and instead convinced O'Hurley to do a reading. "They handed me the J. Peterman catalog, and I had never seen anything like it," O'Hurley said. "It was pastel drawings with something that looked like a Hemingway story. They said, 'We want him to sound the way the catalog is written.'" O'Hurley heard something in the character he describes as a mix of "1940s radio drama and a bad Charles Kuralt." The actor said he played the Peterman character on "Seinfeld" as a "complete lunatic." 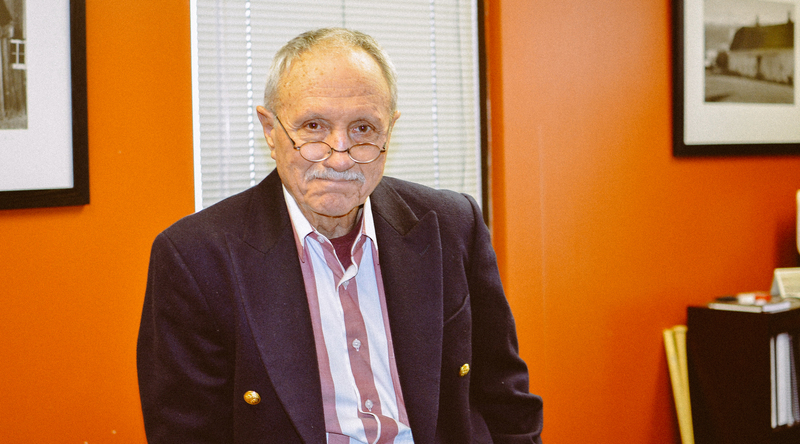 "Truly, he was a Mr. Magoo," "crazy lunatic" and "poet-warrior" character, he said. 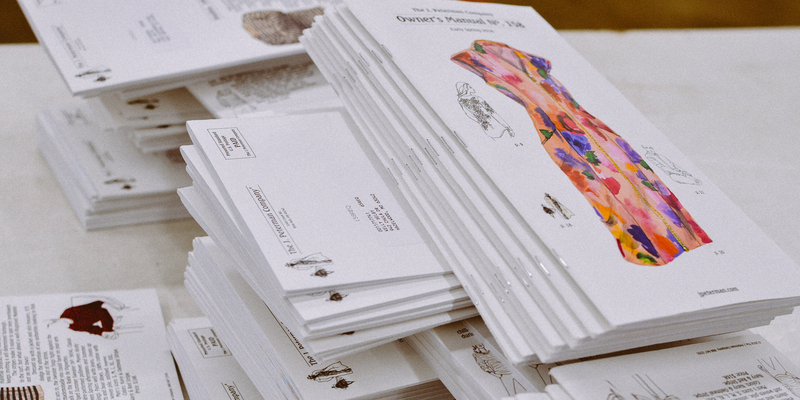 "He was an extension of the way the catalog was written." After the first episode ran, the show's lawyers gave the real Peterman a chance to review every script ahead of airing. (Apparently there had been a kerfuffle with the real-life restaurateur on which the Soup Nazi was based, and the show's legal team started taking extra precautions, Peterman said in his book.) O'Hurley said that Peterman never critiqued him on how he played the character. "And I never commented on the company." Ironically, the year the Peterman character debuted on "Seinfeld," the real J. Peterman Co. posted a $400,000 loss on its balance sheet. By Peterman's own account, the first iteration of his company grew too fast. Smarting from postage increases and the slow growth of a mail-order hard-goods business — and facing pressure from his backers — Peterman in late 1996 started eyeing a "rapid expansion" into brick-and-mortar retail as a way to reach more customers. "I intuitively believed that our niche could be larger than a $65 million a year catalog business," Peterman wrote in the Harvard Business Review. Millions of J. Peterman catalogs go out every year to a customer base split 60-40 between women and men, and who on average are older than 50 and make more than $100,000 a year. "When he started to open stores, he really didn't understand how complex operating stores is," Egelanian said of the move. "You're getting into a whole other layer of logistics, of inventory control." The decision to expand came after a terrible year for retail in 1995. J. Peterman had limped into 1996 with its sales and financial prospects bleak enough that Peterman — on the advice of Arnie Cohen, a former J. Crew president who later joined J. Peterman as chief operating officer — canceled $1 million worth of inventory orders. He flew around the world to do it in person, to keep vendors in the fold. Later, Peterman and his team hatched a plan to open 70 stores and bring in $500 million in sales within five years. None of that happened, but the plan put the retailer on the path to an initial public stock offering in the near-term and won them $11 million in new venture capital. But by the fourth quarter of 1998, after some cash flow hiccups, the company's banker declined to extend its line of credit, setting in motion a series of cash crunches amid the holiday season. In December 1998, Peterman started laying off staff to try to stanch the bleeding. Later that month, their lender imposed a forbearance agreement. Executives couldn't raise enough outside cash to get them over the hump, and J. Peterman filed for Chapter 11 in January 1999. The retailer went bankrupt little more than half a year after "Seinfeld" went off the air. At a bankruptcy auction in March, the women's apparel retailer Paul Harris bought J. Peterman's assets for $10 million. Paul Harris, Peterman wrote in his book, "was practically in another business — a chain of stores that sold mid-price women's knits." Paul Harris executives asked Peterman to run the brand, but that plan fizzled before it materialized, leaving Peterman without a job while the company that bore his name belonged to someone else. "I didn't collect unemployment. 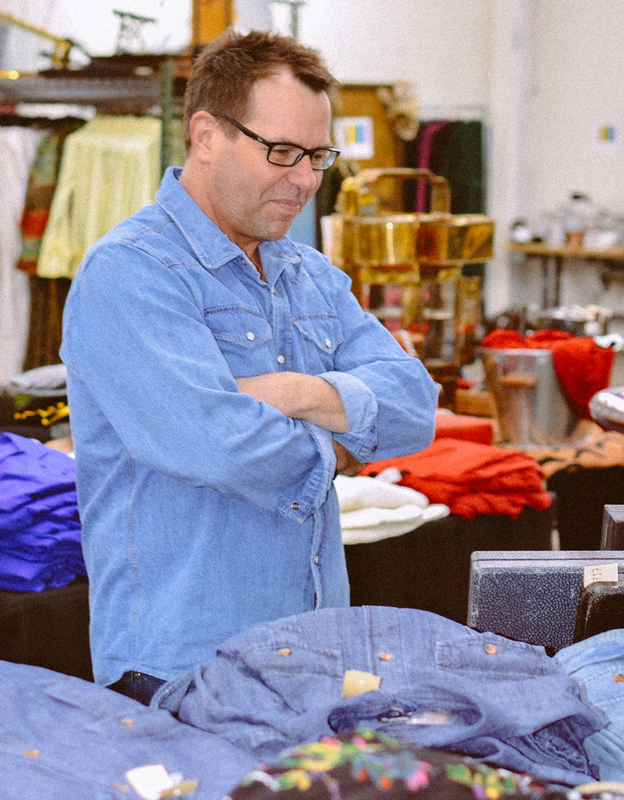 I didn't apply for jobs," Peterman told Retail Dive. "If you don't have a job, you become a consultant. If you go bust, you write a book." So Peterman wrote a book, with less-than-stellar sales. "The Archives" houses the shirts, dresses and other apparel John Peterman and his merchants have bought in shops around the world to source, reproduce or work into their own designs. Sitting in his home office writing, watching the snow melt and the birds come out, he found himself bored. "I like to be in the action, rather than write about it," he said of the time. Around the time that he published his autobiography, "Peterman Rides Again," he got his chance to rejoin the action. In a stroke of luck — good luck for Peterman, bad luck for buyer Paul Harris — the women's retailer went bust a little more than a year after buying the J. Peterman assets. Scott Bernstein, today the chief operating officer of SB Capital and a member of the J. Peterman board, was looking to liquidate some of the assets. He originally bid on J. Peterman assets at the company's own bankruptcy auction but lost out to Paul Harris. Bernstein asked Peterman at the time if he would help appraise them. Soon they were discussing buying back his old company's brand and relaunching the company. "I liked John, I liked the company," Bernstein said in an interview with Retail Dive. "I thought it would be a good investment." Bernstein and Peterman bought the J. Peterman intellectual property, including its brand property and mailing lists, and some inventory for around $600,000, as Peterman recalls — just a fraction of what Paul Harris had paid. Peterman brought in another investor, too: the guy who played him on TV. O'Hurley and Peterman met in 1996 on a talk show, in a segment that introduced the real and fake Peterman to each other, and became friends. O'Hurley said he used to send Peterman wine, and the retailer sent him clothes. In the following years, when the company was building out its physical footprint, the actor went out to a dozen store openings to publicize them. Not aboard the resurrected J. Peterman was its founding copywriter and original creative engine. Peterman acknowledged that Don Staley might have been bitter toward the end of J. Peterman's first run. After Cohen joined the company, "Donald probably felt he was losing control over the creative process," Peterman said, acknowledging that may well have been the case. He says he and his old partner, who died in 2010, eventually reconciled after the bankruptcy. Peterman even bought the typewriter-loyalist Staley a computer. Peterman's son Tim helped run the company starting in 2008. In the years that followed, the company's board wanted to quicken the pace of expansion and sell to the mass market, at lower price points, according to Peterman, who says he was less involved at the time. Kyle Foster was among the longtime employees who left the company in the period leading up to a loss-making year in 2014. Peterman later brought him back, and today Foster serves as president. As the retailer sought out a larger base, some long-time employees left, unhappy with the new direction. By 2014, Kyle Foster, today the company's president, was among them. Foster left for a promotional company on the East Coast, which he noted had sourced some of the same generic sweatshirts for its promotional apparel that J. Peterman did at that time, an indication the retailer had moved away from its core values. According to Peterman, Foster and others would later tell him, "'This thing's all f---ed up.'" For J. Peterman, 2014 didn't look too different from the calamitous year of 1998. The company posted a substantial loss, and its banker reduced its line of credit by $1 million. The next year, the bank said, "'We want out,'" according to Peterman. Beyond the balance sheet problems, the retailer had squeezed its own margins by lowering prices to chase a larger market. Its catalog had also been "cheapened" by using lower quality paper and the copy had "degraded," Peterman said. Peterman took the reins again. He brought Foster back into the fold, as well as Jonathan Dunavant, who had started as a store associate and worked his way into the marketing department. Dunavant, too, left the company in the period after Tim Peterman took over, but later returned and today is senior vice president of marketing at J. Peterman. Matt Peterman joined around that time as well. Having moved to Los Angeles more than a decade and a half earlier to play in a band, he spent most of that time in the film business and has several screenwriting credits. He says he never felt any pressure to join the business, though he had indeed grown up with the company, working the phones in customer service during high school and college. "Whether I wanted to be or not, it's just part of who I am," he said. Today, Peterman's company has around 50 full-time employees and rings up just short of $30 million in sales, he said. That is less than half the retailer's size in its heyday during the 1990s — and less than a third, if you account for inflation. The company's call center has gone relatively quiet, with around 20 employees manning the phones in customer service compared to 300 two decades ago, when the phone, rather than a website, was still the primary medium for making sales inspired by a catalog. In short, J. Peterman today is a much smaller version of its former self. But Peterman, the congenital optimist, the inexhaustible entrepreneur, sees a path to new growth. He thinks the company can push its sales to at least $50 million in the near term, even up to $100 million eventually. Right now, though, "we're too small to make a lot of money," Peterman said. He isn't planning new stores in the near future, not even a flagship, though he is planning pop-ups (along with everybody else). If you're all growth, you're not going to make much money. It has to be better managed than I did the first time. To help the company grow, he's searching for new investments which would "probably" come from venture capitalists. Tensions around growth created both financial and broader business problems for Peterman the last go around with VCs. "How fast you grow, where you get your capital, what you get — who you get it from — are all critical questions," Peterman said. "If you're all growth, you're not going to make much money. It has to be better managed than I did the first time." Some of those tensions with financiers might be endemic to the company. J. Peterman is at heart a family business now more than ever with Matt Peterman directing creative and Audrey Peterman today heading design. Beyond actual familial relations, entry-level employees such as Dunavant and Foster have become fixtures at the company. It makes for a convivial atmosphere around headquarters, but long-time employees also reacted bitterly when, in the late 1990s, Peterman recruited high-level executives from other retailers who brought with them various sorts of corporate baggage and higher salary expectations. Even more fundamentally, Peterman's vision of what his company is and should be doesn't fit neatly into a growth-driven model of venture capitalism. In his 1999 post-mortem on the then-failed business, Peterman summed up the essence of his retail company's concept in just six words: "unique," "authentic," "romantic," "journey," "wondrous" and "excellent." Peterman strove to bake those concepts into the company's assortment, merchandising processes, copy — everything. But those same values ran into a conflict with VC-driven growth in the years and months leading up to the company's bankruptcy. As Peterman recounted in 1999: "Toward the end of the company, we were developing 2,000 new products a year. There is just no way to generate 2,000 products that are truly romantic, unique and authentic." Perhaps because he's seen and lived the downside, Peterman thinks he can manage those tensions better this time around. "Everything is done for two reasons: to make money and to build the brand," he said in March. "If I keep my customer interested and get new customers by keeping them interested, the financials will work out." Ultimately he expects, after a period of capital-funded growth, his company will be sold, in part to bring returns on any VC investment. The sale could be to another retailer, Peterman said, perhaps European. But in any case, he hopes his company will one day be acquired by an entity that wants to "perpetuate and build the brand" and keep it around for another half century or so. And Peterman, who is 76, said he could be making his own exit in about a decade. Externally, J. Peterman faces another challenge to growth: Its customers are getting older. 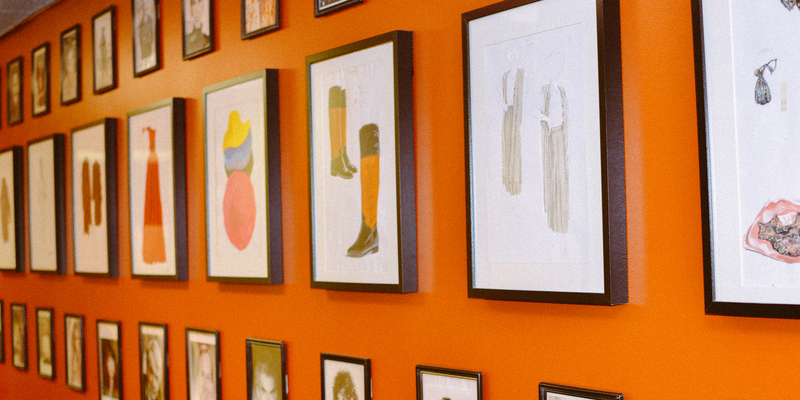 The company's headquarters features a wall of original catalog art and signed celebrity photos. Tom Hanks, Bruce Willis and Clint Eastwood have been among the retailer's fans, as has John O'Hurley, who played the "Mr. Peterman" character on "Seinfeld." "When I started the catalog, everything I liked, everybody else liked. And I thought that was the way you do it," he said. "But we need younger people to buy things." The customers used to be a lot younger, back in the days when their celebrity fans like Hanks and Bruce Willis were in their 30s, and when "Seinfeld," which featured a cast of misanthropic 30-somethings, was on the air. That was a generation ago. Currently the retailer's customers on average are over 50 and make more than $100,000 a year, according to Foster. Peterman said he wants to get the median age down to around 40. If attracting younger customers were easy, department stores and a host of other retailers would be in much better shape these days. Standing between J. Peterman and the wallets of younger shoppers is, among other things, the enormous, complex and quick-moving digital world. An optimistic Wall Street analyst might look at the retailer's rudimentary online presence and see an opportunity for growth. "We've always been digitally oriented, but we've got to get much better than that," Peterman said. The company about a year ago launched tracking ads and re-targeting, according to Dunavant, who also said the company recently started focusing on Google product search. J. Peterman's social media game was pretty much nonexistent until a few months ago, Dunavant added. Matt Peterman noted the company is overhauling its website this year and for the first time is going to feature on-model photography. (With no other retailer would the latter point bear mentioning, but for J. Peterman it's news.) This year the company also hired public relations and advertising firm French West Vaughan to help with brand development. The changes are likely necessary to even start conversations with younger shoppers. Lauren Bitar, director of retail consulting at RetailNext, like a lot of people, was introduced to J. Peterman through "Seinfeld" reruns. Looking at the retailer's website recently, Bitar did a double take. "I had to make sure it wasn't some kind of a false site," she said. "All these products, why can I not find actual photos of what these are!" Asked if she thought the brand was relevant outside of its base, her answer was a simple "no." "This is definitely a niche brand," she said. "What gives it any sort of relevance is that it's mentioned in "Seinfeld." What's there that's different from what I can get anywhere else? Except for that Peterman duster, I don't see anything that is so unique." Search engine optimization and traditional advertising could help with name recognition, Bitar said. Perhaps most importantly, the products themselves need features that distinguish them as J. Peterman clothes, she added. Time will tell if the retailer's changes will win it new fans. Scott Bernstein, for his part, said he remembers concerns about J. Peterman's aging fan base from a decade ago, and the company is still around. "They have a very stubborn, loyal fan base," he said. "I don't know where they're coming from." Others in the company think the brand has an intrinsic appeal to millennials and other younger shoppers who value travel, authenticity, vintage style and brand ethos. In a "Seinfeld" episode from the show's second-to-last season, the Peterman character buys for his own autobiography the rights to the absurd, and yet mundane, life stories of Cosmo Kramer (player by Michael Richards), the eccentric "hipster doofus" living across the hall from Jerry. Trying to capitalize on the book's publicity of his own life, Kramer charters a school bus and drives strangers for the price of $37 (which includes a pizza bagel) around the sites of his life, such as where he fell and ruined a pair of pants he was returning — and wearing at the time, for inexplicable reasons. Kramer billed the bus ride as "The J. Peterman Reality Tour." It's an absurd enough plot line, made even more so by being metafiction. Behind the Peterman character was an actual retailer, whose life was the stuff of catalogs and autobiography, and who in reality is less glamorous and much more down-to-earth than the "lunatic" he was portrayed as on the show. This is the J. Peterman Co.'s peculiar problem. People know the Peterman name, but most know it because of "Seinfeld," and many don't know the company is real. The problem is complicated by Peterman's own insistence on minimizing its association with the show. The retailer has not shunned it entirely. After all, Peterman brought O'Hurley in and the actor has helped promote it, including through a failed crowdfunding campaign in 2016. But Peterman also seems to want his brand's story back. O'Hurley, since he's been on the board, has pushed for the company to do more to capitalize on its Seinfeldian fame. "You can't do a little. You do it correctly, or you don't do it at all." he said. Marketing with the "Seinfeld" connection could help educate customers on the reality of J. Peterman, a sort of "Santa Claus is real" campaign. But, O'Hurley said, "that was something [Peterman] wasn't comfortable with." O'Hurley gave up that fight years ago. Some outsiders agree. Bitar said elevating the "Seinfeld" relationship in marketing could help the company's brand recognition. Egelanian believes that the "Seinfeld" relationship was a large boost to the brand and that O'Hurley's current role in the company "was one of my favorite parts of that story. The guy who played him is an investor." Peterman wrote in 1999 that trying to dovetail too closely with "Seinfeld" "would have been too much of a commercial move." Not much has changed since then. "Seinfeld" is still popular in syndication. Retail is still chaotic and prone to failure. Yet the J. Peterman Co. is still kicking, and its founder is eyeing the next great thing that will satisfy his entrepreneurial urges and desire for adventure. He lost his identity and never got it back. It's really bizarre, if you think about it. 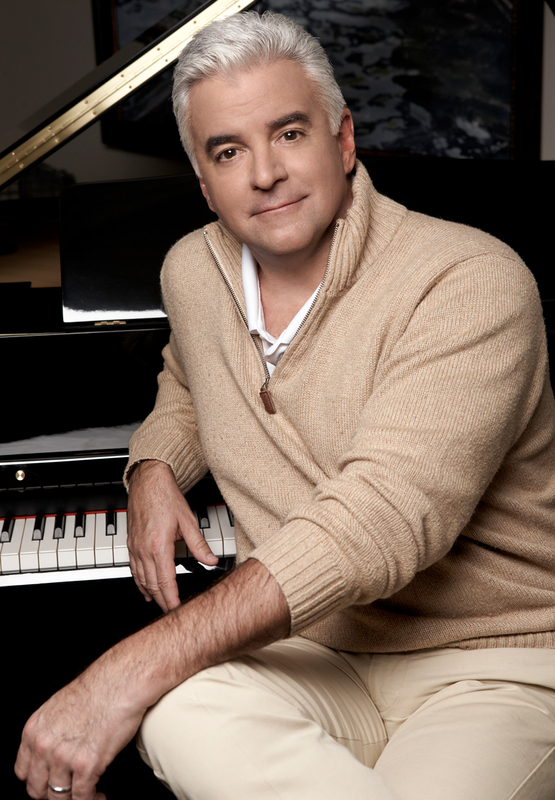 And most people who know the name "J. Peterman" still picture the actor who played him on television. Over the years since they've been doing business together, Peterman and O'Hurley have typically gone out for lunch after J. Peterman board meetings. O'Hurley said that, while walking to or from lunch on Madison Avenue in New York City — the city of "Seinfeld" — "Some cop would roll down the window and say, 'Hey Peterman!'" They always shout at the actor, never the real Peterman. "He lost his identity and never got it back," O'Hurley said. "It's really bizarre, if you think about it."